Wondering how and where to get started on Noam Chomsky? Welcome aboard. 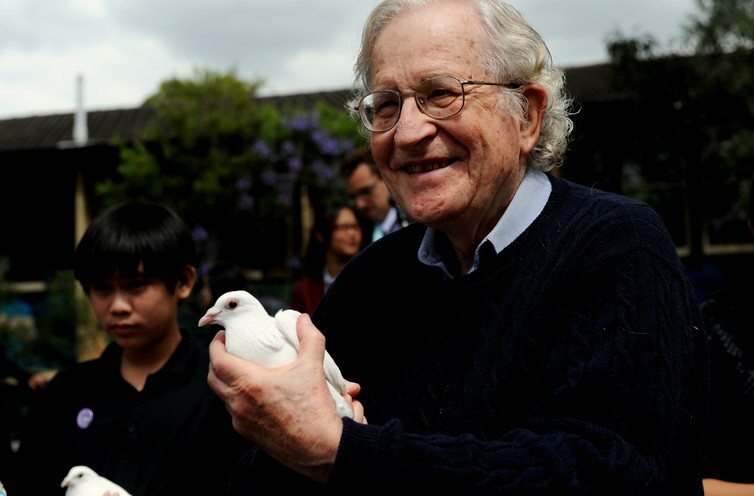 For decades, Noam Chomsky has been the writer most highly-regarded by anti-imperialists, left-wing activists, and anyone who simply wants to challenge the way society programs us to think. If you’ve just been introduced to the genius of this revolutionary American philosopher, linguist, and social critic, we’ve come up with the ultimate starter reading list. So grab yourself a cup of coffee and dive in, your life is about to change. Before you jump on to Noam Chomsky literature, we recommend starting with this 12,000-word article. It’s the perfect introductory piece to the moral drive behind Chomsky’s thinking. The famous essay, even 50 years later, still perfectly encapsulates Chomsky’s main philosophy – that it is an intellectual’s responsibility to “expose the lies of government, to analyze actions according to their causes and motives and often hidden intentions.” It’s a piece that challenges and mocks what he calls the “cult of expertise,” driven by his passionate rally for the truth during the Vietnam War. Chomsky is not everyone’s cup of tea. But if you’re looking to digest him in the easiest, most readable way, should be your first taste. This book is a collection of materials from various lectures, presented in a conversational style between Chomsky and public defenders Peter Mitchell and John Schoeffel. The book covers a lot. In true Chomsky fashion, he shares his knowledge on world affairs while continuously blasting the US government for its power-tripping “world policing” masked as a fight for freedom and democracy. How The World Works is a brilliant read on geopolitics. It’s unapologetic, direct, and eye-opening. This is actually a collection of 4 abridged books written by Chomsky; Secrets, Lies and Democracy; The Common Good; What Uncle Sam Really Wants, and The Prosperous Few and the Restless Many – delivered in big sets of interviews. HTWW explores one main theme: truism in a political world driven by greed and covered up by lies. If you love literature that covers the dark side of capitalism and the modern human condition, you will enjoy this book a great deal. If you want to jump ahead to Chomsky’s most recent essays, you should read Who Rules The World? The book explores the most pressing and relevant issues of our age and even includes an explosive final chapter on Donald Trump. Noam Chomsky bravely tries to answer the big question, who rules the world? And even if you might not agree, it’s still a great read for catching up on the world’s messy affairs. On Anarchism zeroes in on Chomsky’s deep mistrust of power and tyranny. Here, he attempts to dismantle the very ideologies that are deep-seated in our history books. And he makes a good case at that. But perhaps it’s a great starter read if you want to get to know Chomsky in a more personal way. There’s an autobiographical chapter that explores how he became an anarcho-syndicalist. You will also see more of his linguistic expertise on one particular chapter in freedom and language. Deterring Democracy is one of Chomsky’s early core works. It contains perhaps, some of his most brilliant work on US imperialism. The book uncovers the hidden agendas behind US domestic and foreign policies. Chomsky argues that the US has never really prioritized morals but instead, tries to keep other countries in line to its own political and economic goals, thus, deterring democracy. It’s worth noting, however, that this is probably Chomsky’s densest work. And for the casual reader, Deterring Democracy might prove too much. On Palestine is a slim but eye-opening walk through on what is really going on in the Israel-Palestine conflict – a particular social issue that Chomsky has been passionate about for a long time. Together with Israeli author and historian, Ilan Pappe and editor Frank Barat is really a written conversation piece shedding light on the US pathological support of Israeli crimes. It’s a great choice to get started on Noam Chomsky while delving deep into one of the most controversial issues in our modern global affairs. It’s a searing piece that is designed to enlighten you and make you question everything you hear from the media. If you’re not in the mood for Chomsky’s more monolithic pieces, then this read will be more casual for you. Equal parts brilliant and controversial, Manufacturing Consent is arguably Noam Chomsky’s most influential book to date. It’s no news that Chomsky is a great critic of the “free press.” In this book, he takes his case on full focus. Manufacturing Consent explains how the media, even when it’s slightly critical of events, still manipulates the truth over power. Explaining in detail how journalists and media institutions are shaped to favor certain agendas and social issues, and how it affects everything. You’re probably already familiar of this, as there is an equally famous movie of the same title. But even so, this is one read that is bound to knock you over. This list is steering more on politics and world affairs, but in his core, Noam Chomsky is an expert linguist. Language and Mind is perhaps one of his few works that is designed for the general mind. Not to mention that its first 6 chapters have been a groundbreaking contribution to the linguistic theory. And if you want a well-rounded look at Chomsky, it will be great to have all the basics covered. You’ll have a greater understanding of Chomsky’s thinking. Afterall, you won’t be able to understand his ideas without first covering his linguistic background. When you’ve read enough Noam Chomsky literature, you’ll no longer be surprised by his hard-hitting new works. Be it about events that happened a century ago, or ones that are just beginning to unfold now, his insights will continue to electrify you. To round up your starter Noam Chomsky reading list, don’t forget Power Systems. It’s a book that spans the most pressing modern issues we face in the world today. If you have to read only one Chomsky piece to set you off, it’s this. Power Systems is a brilliant and witty analysis of the world’s most controversial events as they have just recently unfolded. Written as a set of interviews by David Barsamian, it’s the perfect insight to Chomsky’s indomitable intellectual brilliance. 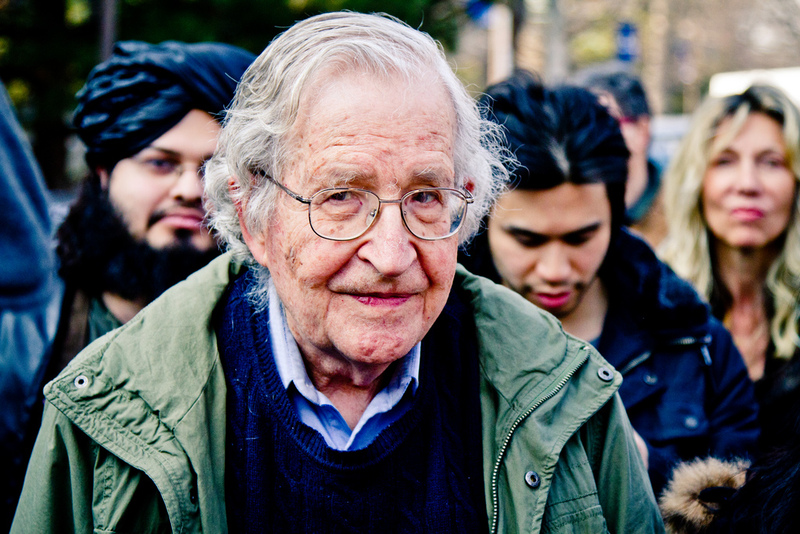 This is a great guide to get started exploring the ideas of Noam Chomsky. Is there a paradox at the heart of the work of Noam Chomsky? If we're to have any chance of decent human survival, we need to act now. If we enter into discussions of politics I could see religion not far behind and soon we might have posters just talking and no one listening. There is a lot of competition in that black pit, Twitter and Facebook to mention just two. Are his works targeting the main Ideapod demographic? If not, who? Ideapod explores the ideas shaping our world. Chomsky is one of the world’s most widely cited scholars. His activist work is followed by millions. Therefore I think his ideas are worth exploring. Also Ideapod focuses on how people think about themselves - about self-knowledge. Religion and politics will become bigger topics on Ideapod as they strongly shape human identity. I will be looking for a post that explores a specific idea he has. Your list has much too much to try and absorb at once. One small step for me.